The Peterskirche is the oldest recorded church in all of Munich. From its founding in 1180, the church has endured a tumultuous history. The Peterskirche was rebuilt in 1368 following a fire, and then again after it was almost completely destroyed in World War II. Reconstruction finally finished in 2000. Due to the age of the church many architectural influences have been added to it through the generations. In the 17th and 18th centuries, the interior of the Peterskirche gained some new Baroque and Rococo features. While inside, look out for Erasmus Grasser’s figure of Saint Peter on the high altar. Here, Peter is crowned with a tiara, which, according to tradition, is removed after the death of a pope until the election of a new one. Visitors with morbid taste should make sure to see the side-altar, which is where the remains of St. Munditia are kept. This Christian martyr’s remains have been kept for more than a century and were moved from Rome to Munich in 1675. Now her skeletal remains, covered in gold and precious jewels, can be seen in a Baroque-era shrine in the Peterskirche. For a great view over Munich, climb the church’s tower, known affectionately to locals as Alter Peter or “Old Peter.” Wear comfortable shoes, since there are around 300 steps to the top. On a clear day, you can see all the way to the Alps. Within the tower, there are seven bells that ring, and one that doesn’t. Behind a barred window in the tower basement, you will find the oldest and smallest bell, which was rung back when executions took place on the Marienplatz. The Peterskirche is open daily. Check local guides, as entry to the tower varies seasonally. The church is not open to visitors during religious services. The Marienplatz U-Bahn (subway) station is just a short walk from the church. Wondering what else there is to do at this famed attraction? We highly recommend purchasing a Private City Center Walking Tour. If you're after even more activities, have a look at our Munich things to do page. 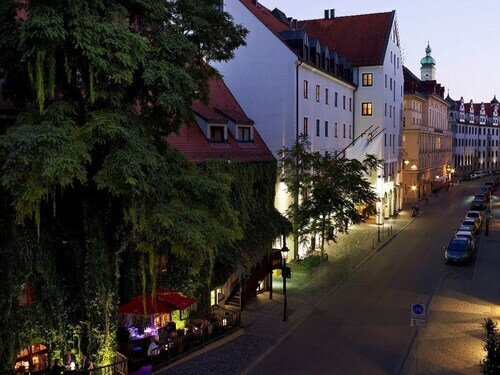 Stroll around this pedestrianized square at the gateway to Munich’s old town and check out Gothic architecture and a lively shopping district. The northerly border of Munich’s old town is marked by this large city square, framed by Italianesque buildings and a Renaissance court garden. The wide range of exhibits at the world’s largest science and technology museum offer brainy entertainment for all members of the family. This old church offers a peaceful place for rest and contemplation, surrounded by some marvelous interior architecture. It is also the final resting place of many prominent Bavarians. The highlight of Munich’s art district is Germany’s largest modern art museum, which presents a dynamic set of architecture, design and modern art exhibitions. For a glimpse into the opulent past of Bavaria’s ruling class, visit this palace in downtown Munich. Enjoy superb views of Heidelberg’s Old Town from the tower of this 14th-century church, which took nearly 150 years to build. 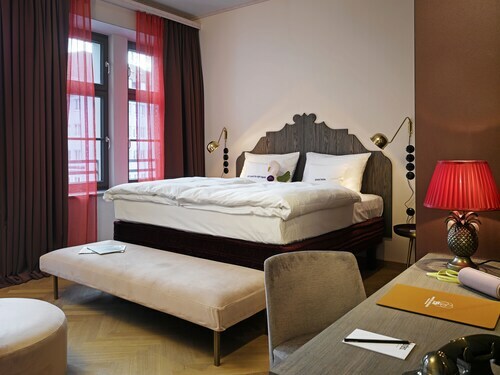 Located in Munich City Centre, this luxury hotel is steps from Hofbrauhaus, National Theater Munich, and Cuvillies Theatre. 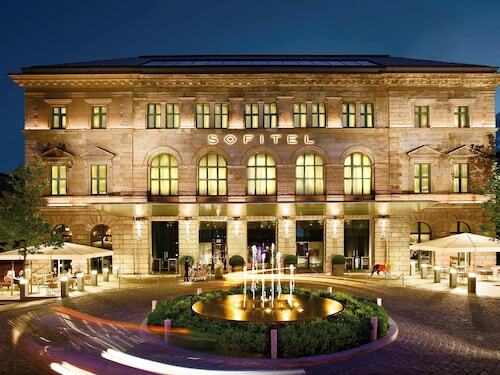 Bavarian State Opera and Spielzeugmuseum are also within 5 minutes. Marienplatz Station is only a 3-minute walk and Odeonsplatz U-Bahn is 8 minutes. 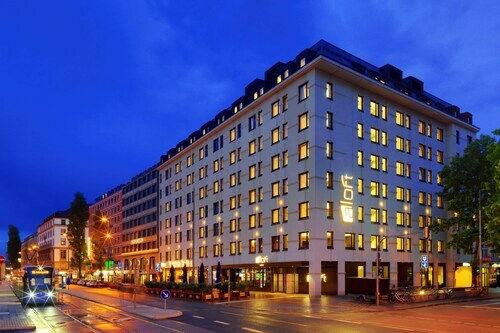 Located in Munich City Centre, this hotel is within a 5-minute walk of Isar Tor and Hofbrauhaus. Viktualienmarkt and Marienplatz are also within 10 minutes. Isartor Station and Marienplatz Station are within a 5-minute walk. 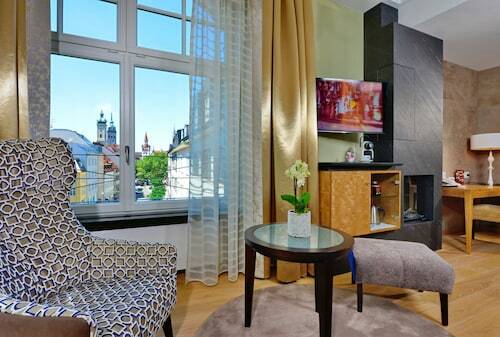 Located in Munich City Centre, this hotel is within 1 mi (2 km) of Karlsplatz - Stachus, Church of Our Lady (Frauenkirche), and Asamkirche. Marienplatz is 0.9 mi (1.4 km) away. Central U-Bahn and Munich Central Station are within a 5-minute walk. 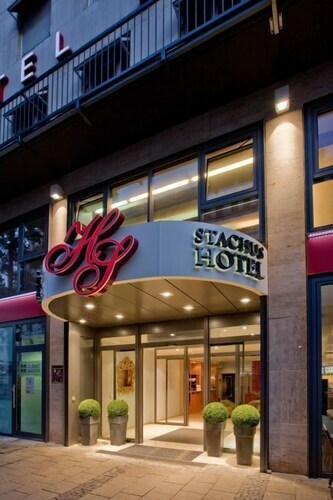 Located in Munich City Centre, this hotel is within 1 mi (2 km) of Marienplatz, Pinakothek der Moderne, and Viktualienmarkt. Hofbrauhaus and Residenz are also within 1 mi (2 km). Central U-Bahn and Munich Central Station are within a 2-minute walk. 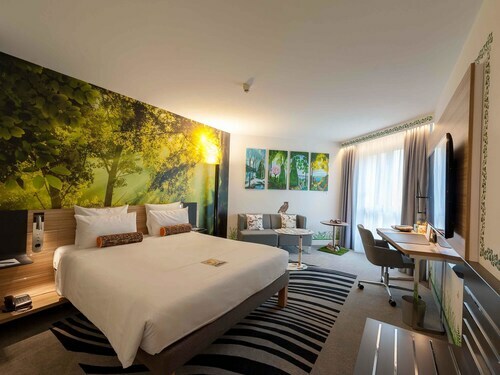 Located in the center of Munich, this family-friendly hotel is within a 10-minute walk of Gasteig and Deutsches Museum. Hofbrauhaus and Viktualienmarkt are also within 1 mi (2 km). Rosenheimer Platz Station is 8 minutes by foot and Isartor Station is 11 minutes.